Plastic Man (Patrick "Eel" O'Brian) is a fictional comic-book superhero originally published by Quality Comics and later acquired by DC Comics. Created by writer-artist Jack Cole, he first appeared in Police Comics #1 (August 1941). 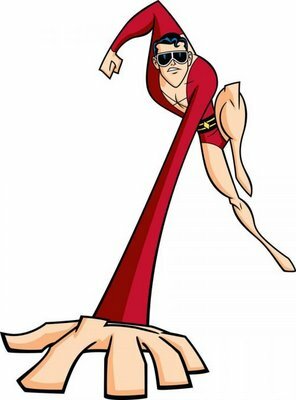 One of Quality Comics' signature characters during the Golden Age of Comic Books, Plastic Man can stretch his body into any imaginable form. His adventures were known for their quirky, offbeat structure and surreal slapstick humor. 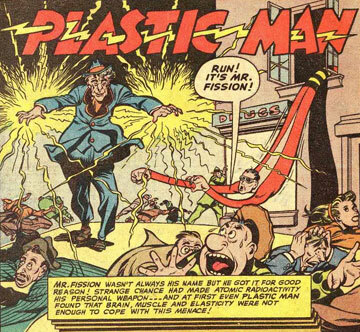 When Quality Comics was shut down in 1956, DC Comics acquired many of its characters, integrating Plastic Man into the mainstream DC universe. The character has starred in several short-lived DC series, as well as a Saturday morning cartoon series in the early 1980s, and as a recurring character on Batman: The Brave and the Bold. 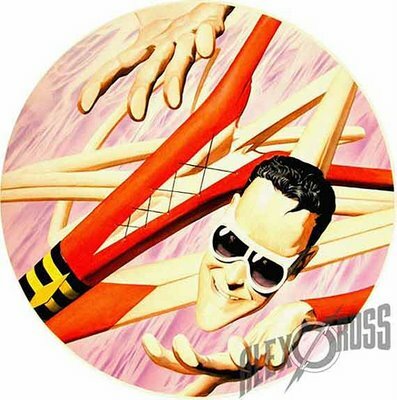 Although the character's revival has never been a commercial hit, Plastic Man has been a favorite character of many modern comic book creators, including writer Grant Morrison, who included him in his 1990s revival of the Justice League; Art Spiegelman, who profiled Cole for The New Yorker magazine; painter Alex Ross, who has frequently included him in covers and stories depicting the Justice League; writer-artist Kyle Baker, who wrote and illustrated an award winning Plastic Man series, and Frank Miller, who included him in the Justice League in the comics All Star Batman and Robin the Boy Wonder and Batman: The Dark Knight Strikes Again. Abilities: Can stretch and shape his highly resilient body into any shape he can imagine, even ones with moving parts. Immune to telepathy. Possible immortality. Origin: Gangster Eel O'Brian stumbled into a vat of acid, granting him amazing powers of elasticity. 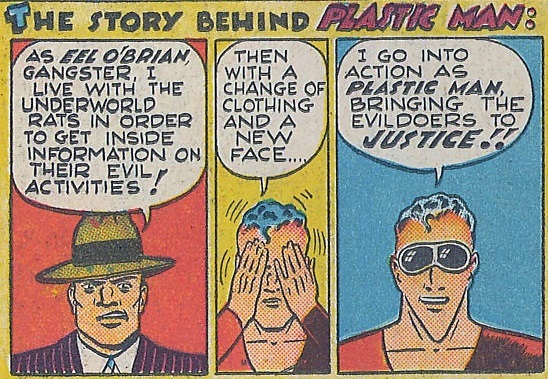 Plastic Man was a crook named Patrick "Eel" O'Brian. Orphaned at age 10 and forced to live on the streets, he fell into a life of crime. As an adult, he became part of a burglary ring, specializing as a safecracker. During a late-night heist at the Crawford Chemical Works, he and his three fellow gang members were surprised by a night watchman. During the gang's escape, Eel was shot in the shoulder and doused with a large drum of unidentified acid. He escaped to the street only to discover that his gang had driven off without him. Fleeing on foot and suffering increasing disorientation from the gunshot wound and the exposure to the acid, Eel eventually passed out on the foothills of a mountain near the city. He awoke to find himself in a bed in a mountain retreat, being tended to by a monk who had discovered him unconscious that morning. This monk, sensing a capacity for great good in O'Brian, turned away police officers who had trailed Eel to the monastery. This act of faith and kindness—combined with the realization that his gang had left him to be captured without a moment's hesitation—fanned Eel's longstanding dissatisfaction with his criminal life and his desire to reform. During his short convalescence at the monastery, he discovered that the acid had entered his bloodstream and caused a radical physical change. His body now had all of the properties of rubber, allowing him to stretch, bounce, and mold himself into any shape. 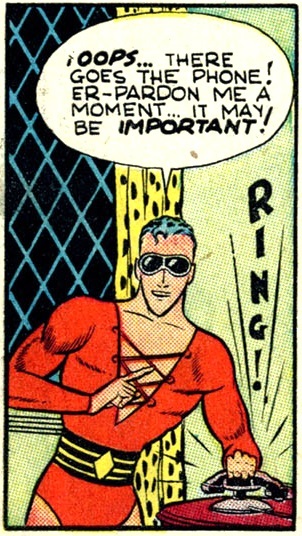 He immediately determined to use his new abilities on the side of law and order, donning a red, black and yellow (later red and yellow) rubber costume and capturing criminals as Plastic Man. He concealed his true identity with a pair of white goggles and by re-molding his face. As O'Brian, he maintained his career and connections with the underworld as a means of gathering information on criminal activity. Plastic Man soon acquired comedic sidekick Woozy Winks, who was originally magically enchanted so that nature itself would protect him from harm. That eventually was forgotten and Woozy became simply a dumb but loyal friend of Plastic Man. In his original Golden Age/Quality Comics incarnation, Plastic Man eventually became a member of the city police force and then the FBI. By the time he became a federal officer, he had nearly completely abandoned his Eel O'Brian identity. Malleable Physiology: Plastic Man's powers are derived from an accident in which his body was bathed in an unknown industrial chemical mixture that also entered into his bloodstream through a gunshot wound. This caused a body-wide mutagenic process that transformed his physiology. Eel exists in a fluid state, neither entirely liquid or solid. Plastic Man has complete control over his entire molecular structure. Elasticity/Plasticity: He can stretch his limbs and body to superhuman lengths and sizes. There is no known limit to how far he can stretch his body. Size Alteration: He can shrink himself down to a few inches tall (posed as one of Batman's utility belt pockets) or become a titan (the size of skyscrapers). Shape-Shifting: He can contort his body into various positions and sizes impossible for ordinary humans, such as being entirely flat so that he can slip under a door or using his fingers to pick conventional locks. He can also use it for disguise by changing the shape of his face and body. In addition, he can alter his bodily mass and physical constitution at will, there is virtually no limit to the sizes and shapes he can contort himself into. Invulnerability: Plastic Man's powers extraordinarily augment his durability. He is able to withstand corrosives, punctures and concussions without sustaining any injury (although he can be momentarily stunned). He is resistant to high velocity impacts that would kill an ordinary person, resistant to blasts from energy weapons, and is completely bullet proof. His bodily mass can be dispersed, but for all intents and purposes it is invulnerable. Regeneration: He is able to regenerate and/or assimilate lost or damaged tissue, though it does take a long time, its far faster than an ordinary human. Immortality: Plastic Man does not appear to age; if he does, it is at a rate far slower than that of normal human beings. In the aftermath of the JLA story Arc "Obsidian Age", Plastic Man was discovered to have survived for 3000 years as little more than crumbs on the bottom of the Atlantic Ocean. He is now over 3000 years old and is still active as a superhero. Ultrasonic Detection: His body will start to "ripple" when an ultrasonic frequency is triggered. Rubber-Organs: As stated by a Black Lantern Vibe. Plastic Man's internal organs such as his heart when Black Lantern Vibe try to rip it out couldn't be killed unlike many of the Black Lanterns' victims, this makes him immune to such attacks. When he was as tall as skyscrapers, he was able to throw/tackle the equally-giant-sized Martian Manhunter through several buildings. Extreme Temperatures: His semi-liquid form remains stable at relatively high and low temperatures...provided that the temperature change is gradual. A sudden change, induces a complete change of phase, creating a truly solid or truly liquid form. Plastic Man was incapacitated in the JLA story arc, "Tower of Babel", when mercenaries froze and shattered his body. Once thawed and reassembled, he was physically unharmed (though emotionally traumatized). In the JLA story arc "Divided We Fall", Plastic Man is shown to have some weakness to extreme heat (intense heat vision attack from a martian) and was temporarily melted. Uniform, Plastic Man's unitard can like its owner stretch, morph, and change size; it is fluid like and unbreakable (material like this is most likely rare and probably why Pat's costume is so small). Goggles, The groovy goggles are Pat's trademark. They can stretch and change size.